Large caliber inferior mesenteric arteries (IMA) are thought to be responsible for type II endoleaks following endovascular abdominal aortic aneurysm repair (EVAR). IMA ligation has been successfully employed to treat this condition. However, limited data exist regarding laparoscopic IMA ligation prior to EVAR. We describe a positive outcome with this technique in a patient at high risk for type II endoleak. A 79 year old male was evaluated for a 5.5 cm infrarenal abdominal aortic aneurysm (AAA) diagnosed by sonography. Abdominal CT angiogram was performed as preoperative assessment for EVAR and revealed a large (7.8 mm), patent IMA originating from the aneurysm. 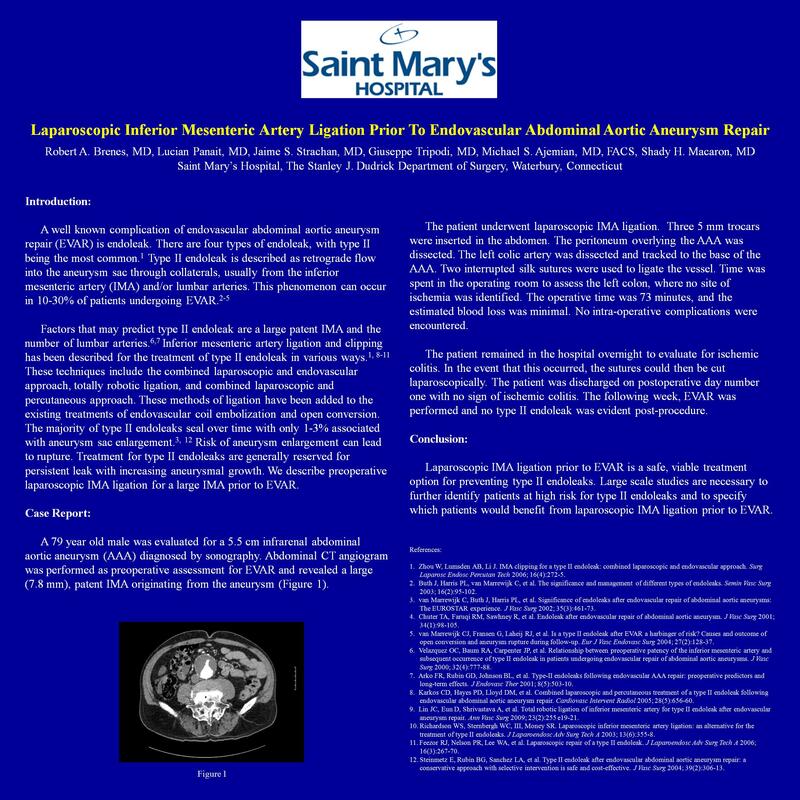 The patient underwent laparoscopic IMA ligation. The peritoneum overlying the AAA was dissected and the IMA was identified at its origin from the aorta and ligated using two interrupted silk sutures. The operative time was 73 minutes and the estimated blood loss was minimal. No intra-operative complications were encountered. The patient was discharged on postoperative day number one with no sign of ischemic colitis. The following week, EVAR was performed and no type II endoleak was evident post-procedure. Laparoscopic IMA ligation prior to EVAR is a viable treatment option for preventing type II endoleak. Large scale studies are necessary to further identify patients at high risk for type II endoleaks and to specify which patients would benefit from IMA ligation prior to EVAR.